Jamaican born Smooth 98.1FM On-Air-Personality and Director of Programmes, Kirk Anthony Derrick has passed on. According to sources, Kirk collapsed a few hours after his show, The Kazbah, yesterday evening May 31 and was rushed to Reddington hospital in Victoria Island where he was pronounced dead. Cause of death will be known next week when the autopsy result comes out. 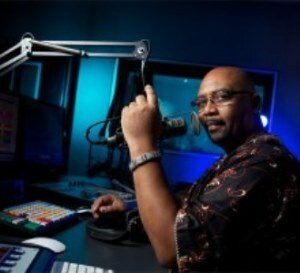 “For him being part of the Smooth 98.1FM family was the next chapter in his life and sadly, it was his last,” Smooth FM said in a press release. Kirk relocated to Nigeria in 2009 to work at Smooth FM. He was 53 years old. He is survived by his wife and children. May his soul rest in peace, amen. Ah so sad, amen. May his soul rest in perfect peace. Hope is not heart disease. Another one gone too soon. I'm yet to come to terms with Banjo Okunuga's death and now this. All I will say is it is well.. I'm tired of crying. Am going to miss him particularly for his programme... the Kazbah. May his soul rest in peace. i remonstrate with Smooth FM crew and his family. Rest in perfect peace Boss. I am deeply, deeply in pain. I will miss you so much. I remember how you disliked it when I called you Sir. You simply wanted to be called Derrick. You were a good Boss, humble and unassuming. The great baritone-voiced Kirk Anthony of Choice FM, UK ! Oh God ! Noooooooo ! Boss, I am crying so much, my vision is blurr, and typing is difficult. I will miss you Derrick ! You were generous. You always preferred your KFC's original Chicken to the Crispy. You just loved it ! I love it too, and that was one of the many things we had in common - our love for Radio and KFC's Original Chicken. Oh Derrick, good night, good bye, sleep well my Good Boss. Gone too soon, kirk anthony.was great working under you.you taught me a lot of things that i will never forget.i'm still in shock.i'm going to miss ur sense of humor nd ur great love for chicken.may your soul rest in peace. I don't know u but may ur soul rest in peace. Rest in Perfect Peace Boss. I am deeply, deeply in pain. I will miss you so much. I remember how you disliked it so much when I called you Sir. You simply wanted to be called Derrick. You were a good Boss, humble and unassuming. The Great baritone-voiced Kirk Anthony of Choice FM, UK ! Oh God ! Noooooooooooooooo ! Boss, am crying so much, my vision is blurr and typing is difficult. I will miss you Derrick ! You were generous. You always preferred your KFC Original Chicken to the Crispy. You just loved it. I love it too, and that was one of the many things we had in common - our love for Radio and KFC's Original Chicken. Oh Derrick ! Good night, good bye my good Boss. Derrick loved Chicken. Derrick loved Radio. He was humorous, with a kind heart. Rest in perfect peace Boss. I will miss you. Good night Derrick Kirk Anthony, the Voice on Radio. Raymond Ayuba of 99.5 Hot f.m Owerri died in similar circumstance, has juju gone into broadcasting? Y always reddington hospital sef...na wa o.
Linda if we cannot learn from this untimely deaths what is the point of blogging. i comment about chicken, chips and cholestrol in an earlier post, u forgot to approve it. Linda if we are crying we suppose dey see. RIP Derrick. wish u are still here. i listen to Smooth FM religiously in the morning. Mazino and the lady, bickering at each other as always.never listened to Kirk. But heard of his death over reviews of his audios and i feel sad that the station lost one smooth staff. I don't know you but you have so many people writing nice things about you - including your subordinates. Some living bosses don't have a smile to their name from even current subordinates. You must have been a good man who preferred to have a positive impact on people. May you find eternal rest with God, and may your family find peace in knowing you will be remembered for your positive impact on even people like me who do not know you. RIP sir. My Jamaican Nigerian Barry White,wonderful ,great,humble man with a heart of milky kindness. you will be so so greatly missed you wonderful man. Your death was a huge shock!my heart goes out to your mother and wife Bev. May God grant your family the fortitude to bear this loss. i pray you find peace where ever you are.